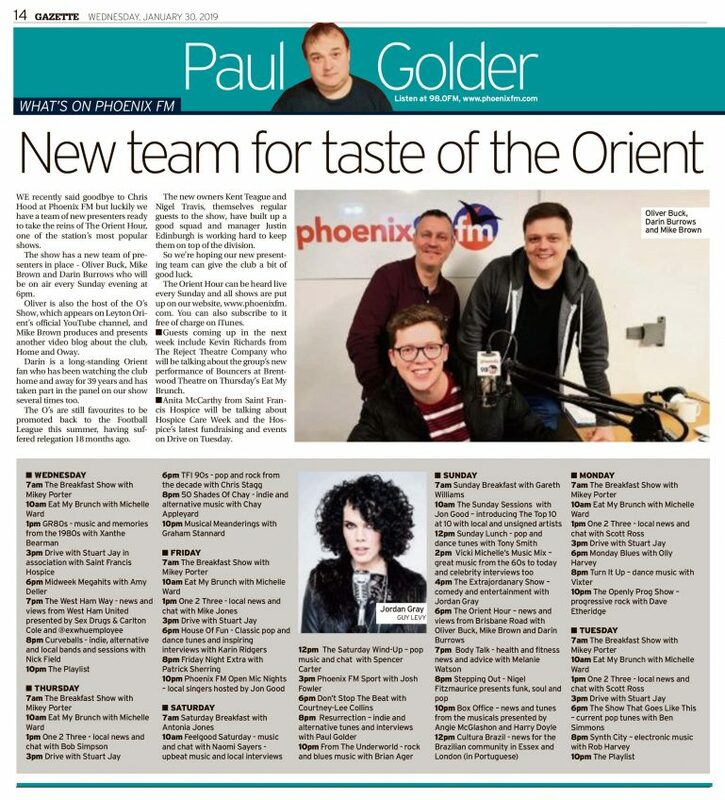 We recently said goodbye to Chris Hood at Phoenix FM but luckily we have a team of new presenters ready to take the reins of The Orient Hour, one of the station’s most popular shows. The show has a new team of presenters in place – Oliver Buck, Mike Brown and Darin Burrows who will be on air every Sunday evening at 6pm. Oliver is also the host of the O’s Show, which appears on Leyton Orient’s official YouTube channel, and Mike Brown produces and presents another video blog about the club, Home and Oway. Darin is a long-standing Orient fan who has been watching the club home and away for 39 years and has taken part in the panel on our show several times too. The O’s are still favourites to be promoted back to the Football League this summer, having suffered relegation 18 months ago. The new owners Kent Teague and Nigel Travis, themselves regular guests to the show, have built up a good squad and manager Justin Edinburgh is working hard to keep them on top of the division. So we’re hoping our new presenting team can give the club a bit of good luck! The Orient Hour can be heard live every Sunday and all shows are put up on our website, phoenixfm.com. You can also subscribe to it free of charge on iTunes. ** Guests coming up in the next week include Kevin Richards from The Reject Theatre Company who will be talking about the group’s new performance of Bouncers at Brentwood Theatre on Thursday’s Eat My Brunch. ** Anita McCarthy from Saint Francis Hospice will be talking about Hospice Care Week and the Hospice’s latest fundraising and events on Drive on Tuesday.